Beecraigs Country Park has been recognised as a great place to visit through receiving Visit Scotland 4 star Visitor Attraction award. Cockleroy Hill path and car park have now been reopened. The path to Cockleroy Hill has been re-opened after recent tree felling work. The car park remains closed, but it will be tidied up and reopened in time for the Easter Weekend. This will allow access for the Linlithgow Churches Together Easter Day service on the top of the hill, overlooking Linlithgow and the surrounding countryside, and also the traditional Easter egg rolling! The woodland at Beecraigs Country Park is carefully managed by the council to provide a fantastic resource for local residents to enjoy our stunning natural environment. We balance the needs of retaining woodland areas to provide shelter for visitors and wildlife alike and, at the same time, ensuring that the woodland is regenerated for visitors to enjoy in the future. A long-term forest plan was approved in 2013 by both the council and the Forestry Commission Scotland. This includes the plans for the gradual regeneration of the forest, such as tree felling, thinning and replanting as required, especially in areas where high winds have affected trees. Any income generated by tree felling is put back into replanting, path upgrading and drainage improvements at Beecraigs and in other woods. The majority of the area of Sitka spruce which has been felled at Cockleroy is owned by the neighbouring farmer. A smaller number of trees have been felled on an adjacent area of council-owned land after both were affected by wind. 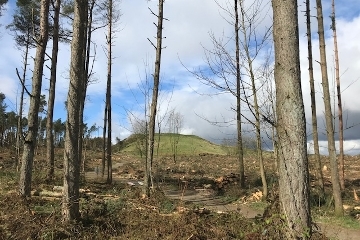 The area of Scots pine on the top of the hill has largely been retained, and it is our intention to replant the felled area on council land with Silver birch, Oak and Scots pine. Many local residents are well aware that Beecraigs is a managed woodland, and we take steps to ensure they are kept informed of any work that is ongoing. Prior to each phase of felling and replanting / thinning work, temporary noticeboards explaining the woodland operations were put up at appropriate locations around the country park and information placed on the council website and social media channels. The timber produced from Beecraigs is Forestry Stewardship Council (FSC) certified and the woodland management is independently audited under the UK Woodland Assurance Scheme (UKWAS). This includes ensuring that woodland management takes due cognisance of biodiversity, for example special care taken to protect badgers setts during the most recent work. Our management has been audited as part of a group scheme by forest ecologists who have praised the varied habitats and forest management which continues to enhance these. The path to Cockleroy has now re-opened and we are working to get the car park re-opened in time for the traditional Easter activities next week. All the areas which were felled in previous years have been replanted, with a number of tree planting events giving young people and the wider public the opportunity to contribute to Beecraigs' new sustainable woodland for future generations. Beecraigs Country Park provides an outdoor experience for many types of user groups. From time to time the Park works with activity providers to agree provision of larger events and activities. Over the May Bank Holiday weekend, the Scottish Cross Country Association (SXC) will be hosting one of their 2019 mountain bike race dates here at Beecraigs. Preparation will be underway from Friday 3 May and the race will be on Sunday 5 May. There will be a closure to the public of the routes that SXC will be using for their races. Please note that this closure will be in place from 08:00 on Saturday 4 May until 17:00 on Sunday 5 May. Signage will be out along the route and information is also available at the Visitor Centre, web site and social media. Spectators should follow any guidance provided by the SXC organisers. Please help us by following all on-site signage and respect the restrictions in place. From the 4th March 2019 tree felling work will take place at Cockleroy for approximately 1 month. During this time, the car park at Cockleroy will be closed and access to paths, trails and Cockleroy Hill will be restricted and may be closed for short periods of time. Beecraigs is open throughout the year and admission is free. Animal Attraction	At Beecraigs, visitors can experience the Red Deer herd, Highland Cattle fold, Belted Galloways and Hebridean and North Ronaldsay Sheep. Caravan, Camping and Little Lodges	Beecraigs is a great destination for a holiday and welcomes caravans, motorhomes, trailer tents and glamping alternative accommodation. Park Activities	There are many activities to enjoy within Beecraigs Country Park. Beecraigs Visitor Centre	The Visitor Centre at Beecraigs Country Park is located just five minutes up the road from the old visitor centre location. Facilities Hire	Beecraigs Country Park can offer many facilities for hire. Countryside Ranger Service	West Lothian Council's Ranger Service has bases at Almondell & Calderwood Country Park, Beecraigs Country Park and Polkemmet Country Park. Fly-fishing on Beecraigs Loch	Beecraigs Loch is a popular water, regularly stocked with quality Rainbow Trout. Friends of Beecraigs Country Park	The Friends of Beecraigs aims to enable and encourage the local community to take an interest in Park.